A presidential candidate charges that the American Social Security system is a “Ponzi scheme” not long after the largest Wall Street Ponzi scheme in history collapsed and wiped out pensioners and charities. Pundits loudly argue the candidate’s claim but almost none challenges the substance. The question is reduced to opinion, not fact. Could Social Security be another version of Ponzi’s and Bernie Madoff’s Cons? Ponzi schemes require an ever-growing base of new investors to make the promised payments to older investors. Ponzi schemes inevitably collapse, and that collapse can be predicted, and proven, mathematically. Like their counterpart, pyramid schemes, Ponzis rely on deception and concealment to hide or disguise their unsustainable model and the reality that the vast majority of participants will never gain the promised benefits. For more than 12 years I have analyzed pyramid and Ponzi schemes, serving as consultant or expert witness in more court cases against them than any other private citizen in America has. I’ve written a book and appeared on national news shows to explain Ponzis and worked for state Attorneys General and the Dept. of Justice that prosecuted them. “Ponzi” is perhaps the most commonly misused and misunderstood term in our economic and political vocabulary. The widespread lack of understanding leads to disastrous consequences. As news reports document, Ponzi scams are proliferating on Wall Street and Main Street in the disguises of investments and home-based “multi-level” sales. Every working American pays into Social Security and millions rely upon it for survival. A claim that our Social Security program is a Ponzi scheme must, therefore, be answered. Social Security does not require an ever-growing base of new contributors. It is sustainable. The rate at which we each contribute to Social Security is calibrated to be sustainable, and if there’s a big change – in birth or death rates or unemployment – it can be recalibrated. Social Security does not employ concealment or deception. It is fully disclosed. Social Security is exactly what it claims to be, a mandated, government operated insurance program. It is not a private, individual investment program. It is a national, social insurance system. As in all legitimate insurance, the transfer of money is intentional and financially sound. Social Security’s sustainability is a matter of mathematically verifiable fact, not opinion. Ponzi schemes, which are not sustainable and which rely on deception, are identifiable. They have traits that separate them from legitimate sales businesses, insurance and investment programs. This is a matter of fact, not opinion. When Social Security is wrongly called a Ponzi scheme its current financial benefits take on sinister aspects. Rather than serving as evidence of the program’s value and a unifying commitment between generations, benefits are recast as generational theft. Those gaining benefits are misled to expect a catastrophic termination and to view them as undeserved “entitlement.” Those still paying in are misled to believe they will never receive benefits and to resent those who currently do. Misusing this term, Ponzi, in reference to Social Security diminishes and divides us all. The difference between Social Security and a Ponzi scheme is the difference between making a withdrawal from a bank and robbing a bank. Ponzi schemes and Social Security both transfer funds from later investors to earlier ones. But as in the bank analogy, beyond this incidental point of similarity, the difference is fundamental and profound, such that one has nothing to do with the other. A Ponzi scheme is a calculated fraud because the promised benefits to each investor require an ever-growing base of new investors. 5 will need 25. 25 need 125, and 11 cycles later, if it could actually continue, the entire human race would be enrolled. The last ones to join never get paid and they are, by design, the majority. 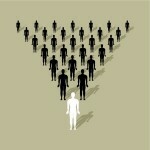 Ponzi and pyramid schemes employ mathematical trickery. When expansion stops or even slows, which inevitably occurs, massive losses follow. The expansion requirement is a fundamental flaw, making the promise of income false. In Ponzis, the impossibility of endless expansion and the false promise of income are always concealed or cleverly disguised. The Ponzi scheme will never fulfill its promise except to the earliest that join and to them only by fraudulent transfers, concealment and deception. Social Security does not require “endless” expansion. Social Security is not an “investment” program. It is social insurance. The transfer is transparent and sustainable. Social Security can be sustained even if the population does not grow. It can fulfill its promise to all. It fully discloses its income, its payments and future projections. The current rate of Social Security payments made during our working years, 12.4% paid jointly by worker and employer, is calibrated to levels of retirement benefits. At present, the average benefit is less than $1,200 a month and provides the majority of income for more than 60% of all Americans 65 and over. The program pumps $727 billion into the economy in benefits each year. Additionally, the reserves are invested in our government bonds and earn interest. Those who receive benefits have paid into the program their entire working years. Many never receive anything due to early death. Some gain more if they live longer. Meanwhile births continue and all begin contributing as they reach working age. This is completely sustainable as long as collective benefits do not outweigh collective payments over a long period. If a major shift begins to occur between collective payments and collective benefits, due to longer life spans or dips in birth rates or periods of high unemployment, Social Security can adjust. In Ponzis, the requirement for expansion is unchangeable; the vast majority of participants are doomed by the scam’s design never to receive the promised benefits. In Social Security, benefits can be slightly reduced or deferred, if necessary. Rates of payments can be increased or a greater portion of taxable incomes can be included in the base. Such change is normal and expected. Economic or demographic shifts can also work the other way, enabling greater benefits, reduced payments or more reserves. Some people may oppose our government’s requiring us to participate in Social Security or object to the government’s management of our payments. They might prefer that we all take our chances, one by one, in a global economy. They may want retirement to be entirely a private matter. This view is entirely valid. But, to use the term, Ponzi, to oppose Social Security or to influence others to oppose it is terribly wrong. It is a slander not just on the program but also on the people who pay into Social Security and receive benefits. The erroneous statement generates unfounded and unnecessary fear and mistrust.Social Security is a public trust, a safety net and a sustainable insurance plan. A national social security program is a public policy of shared responsibility for a nation’s elderly. Ponzis are exactly the opposite. They are calculated scams in which the cunning and predatory take advantage of the vulnerable and unsuspecting, many of whom are elderly. One is the hallmark of a civil society and the other the law of the jungle.